Mr Teiichi Sato runs a seed shop in Rikuzentakata. As a mission of telling his story of narrow escape from Tsunami, rebuilding his shop and sharing Rikuzentakata’s history and geography, he has authored “The Seed of Hope in the Heart.” He chose to write it in English despite the fact that he is not fluent. That way, he could express his unimaginable experience with Tsunami while still being objective and keeping a little distance from the core of his heart. Although he struggled to express himself in English in his first book, today he has written it not only in English (4th edition) but also in Chinese and Spanish. This has not been possible without his passion and strong will for teaching lessons of Tsunami to others and for wanting to convey his gratitude to all support he received from people from different countries. He has been proving to us that there is nothing we cannot do if we do it with our passion and strong will. He is such an inspirational individual. Today, his style of telling his story in his own words attracts many people from different parts of the world. He is also active in sending his gratitude messages to people both from other parts of Japan and other countries who were involved in the relief efforts. For example, in 2014, he visited Taiwan to convey his gratitude and his story. Let’s Talk Foundation has been supporting him in editing, translating and proofreading his publications. In addition, as a part of Let’s Talk Ambassador Project, we supported his visit to Taiwan. Please read more for how we, Let’s Talk Foundation, are inspired by Mr. Sato and how we feel about him. ≫ Who is Mr. Teiichi Sato? Please take a look at a talk between Mr. Sato and Tsuyoshi Komori, the founder/representative of Let’s Talk Foundation. Mr. Sato started writing his memorandum by depicting the scenes from his narrow escape from Tsunami, how he rebuilt his store in the aftermath of the tsunami that destroyed the whole city, and how rebuilding efforts started from very scratch in his own words. At that time, he composed a “Tanka,” a traditional Japanese poem style, and our volunteer coach helped him translated it to English. But, soon after, he began writing English sentences and, with our coaches’ support, he wrote a 50-page long memorandum. Please see below for how he wrote his memorandum and published it. Since then, in efforts of passing on the lessons from the disaster, he has studied history and geography of Rikuzentakata and Sanriku and interviewed other local people who also suffered from Tsunami in order to add more various contents that could be meaningful for future readers. As a next step, he began writing Chinese version of the book 「在心中希望的種子」. “I would truly like to thank people from Taiwan who came to help us greatly and also financially supported us soon after the disaster.” This strong desire moved him to make it happen, Mr. Sato said. And now, he is writing his book in Spanish in order to do the same for people from Spain who have also been providing support. There is a video clip of Mr. Sato reciting English version of “The Seed of Hope in the Heart.” Filming and publishing of this video has been supported by Let’s Talk Foundation. 4th Edition of The Seed of Hope in the Heart was sold at Amazon (now sold to end). In 2017, 5th edition of The Seed of Hope in the Heart is published. 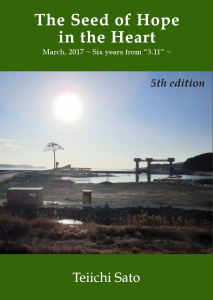 For purchasing “The Seed of Hope in the Heart,” please visit Rikuzentakata Ipponmatsu-chaya (tourism center), Sato-san’s seed shop in Rikuzentakata or order for postal mail delivery (in Japan only). Please contact us if you are interested. In June, 2014, Mr. Sato and Tsuyoshi Komori, Founder and Representative of Let’s Talk Foundation, visited Taiwan. This was a reflection of our vision: Not only did a Tsunami victim talk to people in Taiwan directly to express his gratitude in Chinese, but also we planted seeds for future communication between Tsunami victims and people in other countries. They met a total of 230 people in their 3-day stay in Taiwan. Mr. Sato could thank them directly and could also plant seeds for future borderless communications. For more story of how the idea of Taiwan visit came up, prepared and became true, please click here. 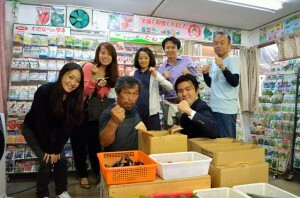 After his visit to Taiwan, many local people at Rikuzentakata visited Mr. Sato’s store and told him, “So many people helped us after the disaster, but it’s been frustrating that we haven’t been able to thank them directly. So, thank you so much for doing that.” This is another seed of hope that we would like to wholeheartedly grow.